Beautiful skies and bright sunshine greeted His Eminence, Archbishop Michael, for his Archpastoral visit to the Nativity of the Virgin Church in Jackson NJ on 20-21 September 2015 to celebrate the patronal feast-day of the parish. Sunday evening the church was filled with parishioners and friends from neighboring Saint Vladimir’s Memorial Russian Orthodox Church (ROCOR) for a Vigil Service. 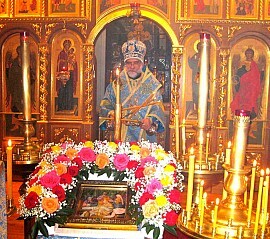 The following day, a Hierarchical Divine Liturgy was celebrated by His Eminence to mark the feast-day of the Nativity of the Theotokos and Ever-Virgin Mary as commemorated according to the Julian Calendar. The Sunday evening Vigil Service was celebrated by Archbishop Michael along with: Archpriest John Prokopiuk (parish rector), Archpriest Joseph Lickwar (diocesan Chancellor), Archpriest Samuel Kedala, Priest Serge Lidkovsky (Deputy of the Rector, Saint Vladimir Memorial Church), Proto-Deacon John Morvay, Proto-Deacon John Suchernick, and Reader Michael Suchernick. After the service everyone proceeded to the parish hall for dinner. On Monday (21 September) a Hierarchical Divine Liturgy celebrated the feast-day of the Nativity of the Holy Virgin according to the “old” Julian Calendar. Archbishop Michael was greeted by parish trustee Joseph Chvasta with the traditional offering of bread and salt, as Father John Prokopiuk welcomed him to the parish. Serving the Divine Liturgy with His Eminence were: Archpriest Father John Prokopiuk, Archpriest Joseph Lickwar, Archpriest Gary Breton (Dean, New Jersey Deanery), Archpriest Sergius Kuharsky, Priest Serge Lidkovsky, Proto-Deacon John Morvay, Proto-Deacon John Suchernick, Reader Alex Golubov (parish choir director), and Reader Michael Suchernick, along with altar servers from Saint Vladimir’s Memorial Church. 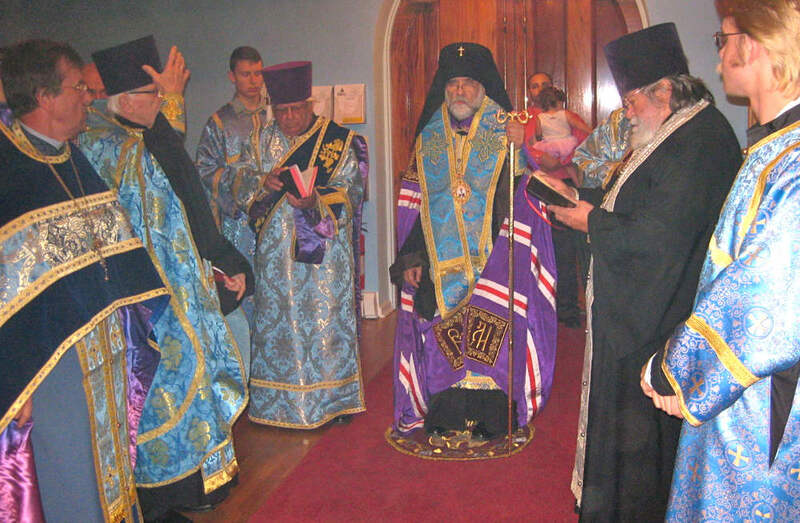 At the conclusion of the Hierarchical Liturgy, a Molieben (service of thanksgiving) was celebrated followed by a procession to the grave of the ever-memorable Archbishop Gregory (former Bishop of Sitka and Alaska) where a memorial Panikhida service was offered. Those present proceeded to the parish home for lunch prepared by Matushka Ludmila Prokopiuk and the Parish Sisterhood.